For true crime enthusiasts, ‘’Mindhunter’’ should feel close to heart as it focuses on the understanding of killers and how their minds work. We follow the work of two FBI agents – Agent Holden Ford (Jonathan Groff) and seasoned Agent Bill Tench (Holt McCallany) on their path to developing a system that assists in understanding their subjects better. In the year of 1977, they start their journey around the U.S. interviewing the most gruesome killers of the time. As the episodes progress we face the common question of nature versus nurture – are serial killers born as they are, or are they moulded by life? Should people try to understand killers better, or should they all be labelled under the broad term ‘evil’? The killers are approached by putting on a mask, an act to enable the main character to speak their language and gather more information. It is a mind game – one that is questionable, yet genius all at once. Yet, the skill of so naturally being able to speak the killer’s language becomes unsettling. It leaves us wondering if a person with such a skill can truly be deemed as ‘normal’. Serial killers are known for sparking inspiration for creators as people tend to have a grim fascination with horrifying and dramatic deaths. The most interesting scenes are those that feature the killers, such as the first interviewee – Ed Kemper (Cameron Britton), the Co-Ed Killer. He appears to be quite true to life – an easy-going, open character. In fact, the plot is loosely based off a non-fiction book of the same name written by John Douglas and Mark Olshaker. In the book, Agent Douglas takes us behind the scenes and examines iconic cases he worked such as those of Charles Manson, Ted Bundy and Ed Gein. Many shows with similar themes, tend to include flashbacks and re-enactments of the crimes as they are committed, blowing the show’s budget on that bit of airtime. ‘’Mindhunter’’ is more stripped back. 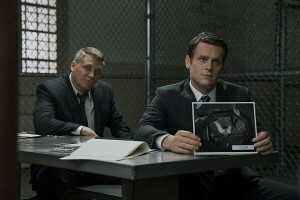 Each episode’s setting centres around interrogations and interviews with only the two agents and a killer in one room. It does sound quite bleak when described in that way, but ”Mindhunter” makes it work, perhaps thanks to its executive producer – David Fincher. Fincher is behind acclaimed movies such as ”Fight Club’’ and ”Gone Girl’’ and elements of the works these works can be seen in this creation as well. It has that same cool, even gritty atmosphere to it, moving at a slow, glacial pace. Through the span of ten episodes, barely anything ground-breaking happens in the crime-fighting world, which brings in a sense of realism to the show by contrast to other Fincher productions such as ‘’House of Cards’’. The show doesn’t rely on action or gore, nor is there much of a true culmination or climax. Instead, the pacing feels methodical, calculating – as if talking about a vile act of murder with a completely blank and remorseless tone and expression. It’s chilling, like watching Bundy’s last interview before he faced the death penalty. The series is well-balanced, realistic and eerie, even hard to watch for more sensitive audiences. When a slow approach that strips down on sexual themes and blood may not work for some shows, this is what seems to add to the appeal of ‘’Mindhunter’’. It is obvious that the first season only touches upon the very start of the story, setting up the sequence of events for seasons to come. ‘’The Exorcist” – Are demons just metaphors? Verdict: welcome to “Hell on wheels”!